The CVHC meeting on Saturday, February 9, 2013, was held at the Gekkeikan Sake Factory in Folsom, California. The members attending, Lynne Sperry, Bill Owen, Yvonne Cabalona, Ricardo de Bernardi and Leslie Rose, brought a feast of foods to munch on while we shared news before we got down to business. The major business of the day involved preparing for our next Jerry Kilbride Memorial English Language Haibun Contest. Adjustments were made to the contest rules in preparation for posting to the public. We again settled on December 1st as the contest deadline for this year so that participants will have ample opportunity to send in many haibun. 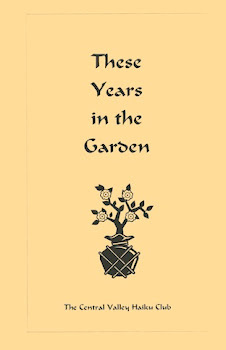 We were delighted to hear that Bill Owen has won The Museum of Haiku Literature Award. With no other pressing business to take care of, we then turned to the creative part of our get-together, sharing haiku and then using them to create tan renga. By meeting's end we had a dozen poems to show for our efforts, a very productive output for the afternoon. Our next meeting will be Saturday, April 20, 2013, at the Golden Empire Restaurant on Howe Avenue in Sacramento, when we will again share laughter, food and poems.